When you call Duane Morris alum Mark Cedrone at his office, it's clear you haven't reached the typical Am Law 100 law firm. The 56-year-old white-collar criminal defense lawyer whose name is on the door personally controls the telephone hold music. "My favorite was a Johnny Cash cover of the Tom Petty song, 'I Won't Back Down,' says Mark. "Clients loved that one." Playing Cash as hold music for callers is just one of the perks of working for yourself at the Law Offices of Mark E. Cedrone. "I wanted to do things a little bit differently than we had over there," says Mark, referring to the start of his career at Duane Morris in Philadelphia 27 years ago. "I wanted to become my own man in the legal community." And he has. 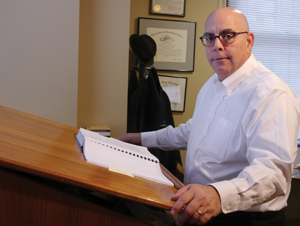 Mark considers Duane Morris a cornerstone of his legal education and still maintains very close relationships with former colleagues like Michael Mustokoff, Tom Ostrander and Teresa Cavenagh. But these days, he very much does his own thing. From his Broad Street office in Philadelphia, he represents a variety of clients, including public officials, in white-collar criminal disputes, criminal tax investigations and fraud cases, as well as in civil tax disputes. This year, Mark represented a company that operates a series of adult book and novelty stores in litigation before the United States Tax Court. In addition, he represents indigent defendants in federal criminal cases through the Criminal Justice Act. Work is so busy that Aubrey Emrich, 31, the oldest of Mark's three daughters, came to practice law with him in 2011. Duane Morris alum Mark Cedrone with daughter and colleague Aubrey Emrich in front of Philadelphia City Hall. "Duane Morris may have been the first big Philly firm to have a group of people dedicated to white-collar criminal litigation," says Mark. "Actually, we called it the 'Special Litigation Group' because firms didn't like that word, 'criminal.' It was a very interesting and congenial group of people. Everybody was accessible." It wasn't just the formal work that taught Mark how to practice law. "Every Friday afternoon, a significant subset of the department would start to gather in a senior partner's office, where there was a free flow of ideas with a bunch of bright people. Mike, Teresa and I would bounce ideas off of each other. A risk at a big firm is that the 10 people with whom you work are the only 10 people you know," he says, but at Duane Morris, he spent time with other lawyers he wouldn't ordinarily encounter. "I used to look forward to seeing [Duane Morris Chairman and CEO] John Soroko. We may be at the opposite ends of the political spectrum, but over the years we found common ground with movies. Even now, if I bump into John, we will immediately rekindle that understanding." Mark left Duane Morris in 1992. "I saw a market for people who needed sophisticated white-collar tax dispute representation, but who maybe couldn't afford the larger firms." For a time, Mark practiced with the late Tom Carroll, at the time considered one of the top criminal defense attorneys in Philadelphia. Carroll died in 2002. "With six years of great mentorship at Duane Morris and then seven years with Tom Carroll," says Mark, "I feel I have received the best legal education that anyone could have gotten after law school—bar none. Duane Morris taught me the value of how to exploit hard work and how to develop creative ideas, and Tom took it to the next level." With a lawyer who "won't back down," what more could a client ask?